Below is a list of help topics, instructions, and downloadable guides designed for library and organizational administrators. Click on a topic to read more. To use the institutional administration dashboard, log in to your account. Once logged in, click the arrow next to your name, found in the black bar at the top of the screen. This brief PDF guide contains a quick overview of the institutional administration dashboard. 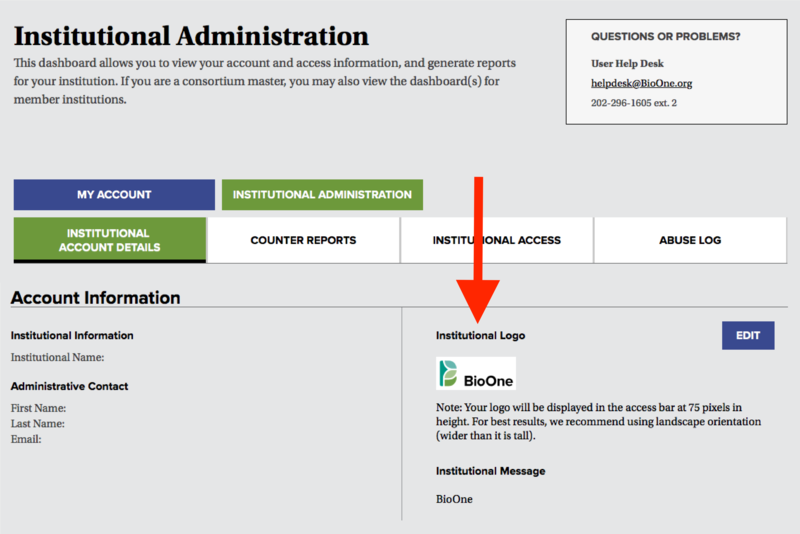 If you are an administrator and unable to access the institutional administration dashboard, please contact helpdesk@BioOne.org for assistance. To add, remove, or obtain a list of the institutional administrators associated with your subscription, please contact helpdesk@BioOne.org. To view your institution's subscription information, log in to your account and visit the institutional administration dashboard. Select the Institutional Access tab. Note that you can access your personal account details by clicking the blue button titled My Account. This tab will show you the license associated with your institution, its expiration date, and the content accessible to your institution. If no subscription information appears or if it appears incorrectly, please contact helpdesk@BioOne.org. When a user's IP is affiliated with a subscribing institution, the institutional name and logo appear in an "Access Provided By" popup that the user can close. To add or change your institution's logo, log into your account and visit the institutional administration dashboard. Under the Institutional Account Details tab, find the Institutional Logo section . Click Edit to upload your institution's logo, and enter any message you would like your users to see when logging in. Size: Images of any size are acceptable, however they will be scaled to display in the popup at 75 pixels in height. For best results, we recommend using landscape orientation (wider than it is tall). Format: .jpg, .png, .gif, OR .bmp files. File Size: The image file can be a maximum of 2MB. Length: The message can be a maximum of 200 characters. If you encounter issues uploading or viewing your institution's logo or message, please contact helpdesk@BioOne.org. Please visit the Title Lists page for current title lists, KBART-compliant files, and list of title additions and departures. You can also access the Title Lists page from the institutional administrator dashboard. Navigate to the dashboard, and select the navigational tab labeled Institutional Account Details. Scroll down to the KBART and Title Lists heading, and click the link below it. This will bring you to the Title Lists page mentioned above. Download the MARC records for BioOne Complete, and integrate them into your institution's discovery system. To add an IP address, remove an IP address, or view a list of IP addresses currently associated with your institution, log into your account and visit the institutional administration dashboard. Select the Institutional Account Details tab, and scroll down to the IP Addresses subheading. Select Edit to view the IP addresses currently associated wtih your institution. To remove an IP range, select the small grey X next to it. (See 1). 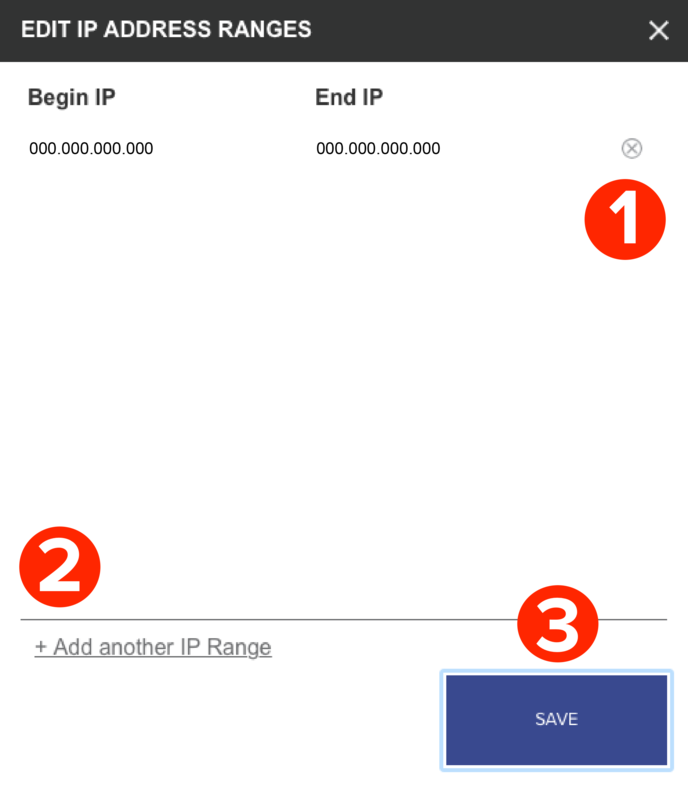 To add more IP ranges, click the link Add another IP Range (See 2). To submit your changes, click on Save (See 1). If you encounter any issues entering your IPs, please contact helpdesk@BioOne.org. Setting up an institutional username and passcode for your institution is a way to give your users access to BioOne Complete without IP authentication. Set an Institutional Username only if you would like your institutional subscription to be accessed with a username rather than via IP address. To set an institutional username and passcode, log into your account and visit the institutional administration dashboard. Select the Institutional Account Details navigational tab. Scroll down to the AccessDetails heading and find the Institutional username subheading. Click on the Edit button to enter and save a new instiutiional username and passcode. As a reminder, this is a "Passcode" and not a password because it is stored in plain text both on the blind login page and in the database. Do not re-use a password for this. To set up a Blind Login, please contact helpdesk@BioOne.org. BioOne supports the SAML 2.0 protocol for federated identity, allowing end users to authenticate using an institution’s Shibboleth credentials. The institution and BioOne must both be members of the same federation to use this method of authentication. You can view your institution's Shibboleth details by visiting your institution administration dashboard, and clicking the tab titled Institutional Account Details. Find the Access Details heading, and scroll to the Shibboleth subheading. There you can see the EntityID and Federation currently associated with your institution. For assistance configuring Shibboleth access, contact helpdesk@BioOne.org. Please note that the new platform uses secure http (https://). In order for EZproxy to give remote users access to resources with secure URLs, you must obtain, install, and configure an SSL Certificate (if you have not done so already for other secure resources). For more information, see EZProxy’s documentation here. If you encounter issues setting up EZProxy access, please contact helpdesk@BioOne.org. BioOne Complete supports outbound linking to your link resolver. When outbound linking is configured, a link is provided in the References tab of an article or chapter that takes the end user to the link resolver’s result page for the reference being cited. To access your institution's OpenURL settings, log into your account and visit the institutional administration dashboard. Under the Institutional Account Details tab, scroll down the page to the OpenURL subheading, and select Edit. In the form that appears, you can enter your institution's base URL, the link text, and a button image. Please note that the image must be a .png, .jpg, or .jpeg, and sized to 85 x 20 pixels. BioOne OpenURL base URL: https://bioone.org/openurl? If you encounter problems configuring your institution's OpenURL, please contact helpdesk@BioOne.org. BioOne is a participant in both Portico and LOCKSS to provide comprehensive archiving and preservation of all included content. This dual participation also protects the BioOne aggregation in the case of a "trigger event" or catastrophic failure. In addition, as part of BioOne's standard licensing agreement with its publishers, BioOne requires perpetual archival rights for content included in the BioOne Complete aggregation. This ensures that libraries that subscribe to BioOne Complete and later cancel their subscription have access to the volumes and issues they purchased earlier. Similarly, content deposited by titles that may leave the aggregation is required to remain accessible to subscribers in perpetuity. Perpetual access is provided to subscribers at no cost and via the BioOne Complete platform (i.e., via the same method as their current access). LOCKSS (Lots Of Copies Keeps Stuff Safe) is open source software used to preserve web content. If your institution participates in LOCKSS, log in and visit the institutional administration dashboard to view the LOCKSS server IP address currently registered in our system. Navigate to the Institutional Account Details tab and scroll to the LOCKSS subheading. If a LOCKSS server IP address is registered, it will appear here. If your institution participates in LOCKSS and you need to change your registered LOCKSS server IP address, contact helpdesk@BioOne.org with the IP address would like to add or remove. 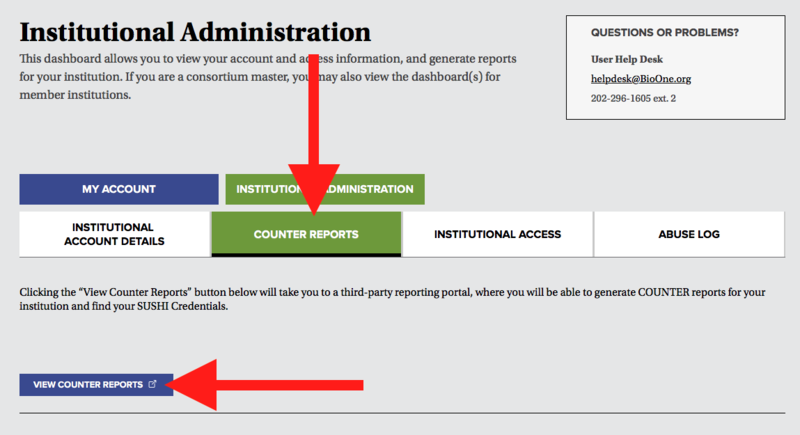 To pull COUNTER reports, log into your account and visit the institutional administration dashboard. Select the navigational tab Counter Reports. Follow the link in the space below the tab to pull usage reports for your institution. Please note that the new BioOne Complete platform is compliant with COUNTER 5 standards. Please consult this guide (PDF) for a brief introduction to COUNTER 5 and the SIQ reporting interface. This new tool will provide data from the current COUNTER reports. COUNTER 4 reports are available for the previous two years, 2017-2018, as well as for Jan-Apr of 2019. For older reports please contact helpdesk@BioOne.org. If your institution uses a SUSHI tool to harvest COUNTER reports, you will need to configure that tool’s settings with BioOne Complete's SUSHI service URL (https://sushi5.scholarlyiq.com/counter/r5) and the credentials required to access this service (your Requestor ID and Customer ID). Find your credentials by logging in to BioOne Complete and clicking the arrow next to your account name in the black bar at the top of the screen. Click Institutional Administration, then select COUNTER Reports, then click the “View COUNTER Reports” button to access the reporting dashboard. In the top right of the reporting dashboard, click the green button labelled with your institution's name to display a menu; finally, select SUSHI from the menu. A one-time registration will be required in order to view your Requestor ID and Customer ID. NOTE: A SUSHI server is currently in place to harvest COUNTER 4 reports. The SUSHI R4 service URL is http://sushi4.scholarlyiq.com/SushiService.svc. Please use the same Requestor ID and Customer ID you would use for the current SUSHI server. Please note that the SUSHI R4 server will only be available throughout the end of 2019, and then phased out. To view abuse reports logged in your institution's IP ranges, log in to your account and visit the institutional administration dashboard. Navigate to the tab entitled Abuse Log. From this tab, you can review any abuse reports. If you have questions about this feature, please contact helpdesk@BioOne.org. BioOne actively seeks partnerships with search providers, indexers, and library discoverability products to ensure that content* from BioOne Complete is both discoverable and fully linked to leading resources. This connectivity is important to the visibility and accessibility of our publishing partners' content, and facilitates a seamless experience for researchers. For more information about linking, indexing, or text mining content in the BioOne Complete aggregation, please contact us. *Only select publications are included in MEDLINE, PMC, SCOPUS, Web of Science, and subject specific A&I Databases. The BioOne Complete platform supports the client/server protocol Open Archives Initiative Protocol for Metadata Harvesting (OAI-PMH) for requesting and returning metadata from the BioOne Complete aggregation. Please note that the URL has changed from http to https. The OAI-PMH client (called the harvester) uses six types of requests (called verbs) to obtain metadata from the BioOne Complete platform. One of the verbs is added to the base URL to specify the type of request. For reference, here is the name file. For more information on OAI-PMH, please visit OAI-PMH's website. If you encounter any issues harvesting metadata, contact helpdesk@BioOne.org. BioOne offers librarians periodic group webinars on effectively using the BioOne Complete website and administering their subscriptions. To schedule a demonstration, training session, or custom webinar for a group at your institution, please email Library Services with your request. We will be happy to set up a meeting time that is convenient for you and your colleagues. BioOne Complete includes a robust Help section, which features information on many topics of use to your patrons. We have also created a brief guide (PDF) to walk your users through a few essential functions on the website. The BioOne Complete Help Desk is also available to answer any questions. One of the best ways to get the most from your subscription is to make sure that your users know that they have access! We have several promotional items ready for your use below. We are also always happy to collaborate on a custom piece: please contact us. A quick way to promote your subscription to BioOne Complete is to include us in your A-Z listing, through a monthly newsletter, or by hanging a BioOne poster in the library. Below is BioOne Complete's logo, plus some descriptive text. Note: The BioOne Complete logo is available for download and authorized, non-commercial reproductions. For questions on appropriate use, please consult our Terms and Conditions of Use. To help our partners display the BioOne Complete logo consistently, we have a Content Delivery Network (CDN) so that the correct file is always in use. To ensure that the most recent and up-to-date logo is being used, please do not download and alter the logo. When you incorporate the BioOne Complete logo into your site, please copy and paste the HTML tags exactly as they are presented below. To download the BioOne organizational logo, please visit our organizational website. If you encounter difficulties embedding the logo or have questions regarding use, please contact us. BioOne Complete is the full-text database of more than 200 titles from over 150 society and independent publishers in the biological, ecological, and environmental sciences. The collection offers comprehensive coverage of fields such as zoology, plant sciences, ornithology, and entomology, with new content added daily. Visit BioOne Complete to explore the full breadth of resources the collection offers. BioOne Complete is the full-text database of more than 200 titles from over 150 publishers in the biological, ecological, and environmental sciences. The collection offers comprehensive coverage of fields such as zoology, plant sciences, ornithology, and entomology, with new content added daily. Don't see the information you need here? Check out our Help Section or contact the Help Desk.